The story starts soon after Cambodia peacefully gains its independence from France in 1953. A period of relative economic success follows under the restored monarchy, led by Prince Norodom Sihanouk. The prince was a patron of the arts and a bit of a singer himself, and music and traditional culture thrived. 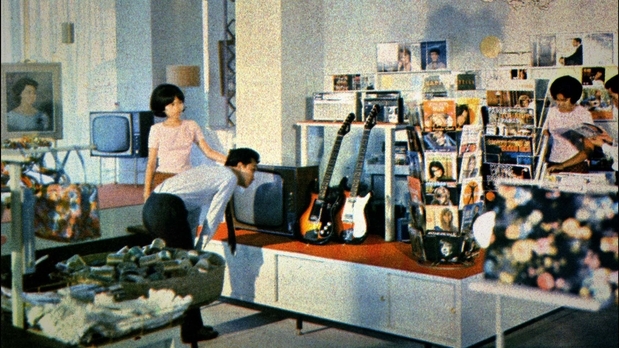 Pop songs soon became all the rage, with vocalists both male (Sinn Sisamouth) and female (Ros Serey Sothea) becoming idols across all age groups. At first, the tunes are reminiscent of French and Afro-Cuban styles; as we get into the Sixties, the British and American rock influences seep in. There is a certain lulling appeal to this first part of the film. The capital Phnom Penh is a vision of blossoming trees and bright boulevards, towering temples and lively clubs. Especially when the soundtrack features the keening, ethereal tones of the woman singers, the sights and sounds float by like an exotic dream. “When we were young, we loved to be modern,” one of the participants says right at the start. It is a simple as it is heartbreaking, knowing the nightmare that this dream will morph into. Still, it is fun to learn of the different musical artists and their evolution through the better part of twenty years. News that the war in neighboring Vietnam is spilling across their border comes at first in brief segments. Prince Sihanouk tries to remain neutral, even in the face of President Nixon’s bombing of his country to try and stymie the North Vietnamese communists. Still, the happy teens congregate and the music plays on into the late 60s and early 70s. Guitar bands like Baksey Cham Krong and mildly rebellious artists like troubadour Yol Aularong and sassy-girl singer Pen Ran are readily identifiable in the global pop canon. It all starts coming apart in 1970 when the prince is deposed in a right-wing coup and naively allies himself with the Khmer Rogue. Far from being “modern,” the Khmer Rouge were pathological ideologues who, upon taking power in April of 1975, emptied Phnom Penh and other cities with the demented idea of creating a pre-industrial agrarian society—in effect turning the whole country into a big prison farm. A quarter of Cambodia’s population would not survive the regime’s four year rule, and as many as two million died from hunger, disease and summary execution in the world’s worst such event since the Holocaust. Pirozzi, as befits his subject, keys in on the Khmer Rouge’s particular contempt of artists, a group who are “close to the people” and thus deemed a dangerous challenge to their dogma. Singer Sieng Vanthy recalls how her life was saved because she convinced authorities that she had been a banana seller before the takeover. 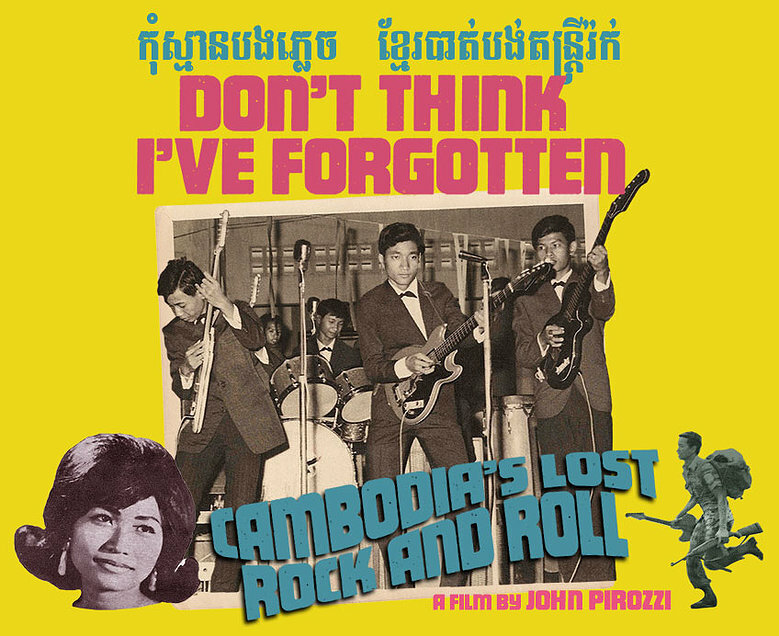 At the end of “Don’t Think I’ve Forgotten” Pirozzi shows the present-day (and once again sparkling) Phnom Penh, with its easeful citizens, pop talent shows and stores with racks of CDs, some of them re-issues of those old albums we almost feel we know by now. Things aren’t perfect. Much like Prince Sihanouk (who was good on the arts but stymied political dissent with his secret police), Cambodia is today ruled by Hun Sen, a long-reigning strongman (and Khmer Rouge defector) who can make life very uncomfortable for his opponents. On the plus side… well, he has managed not to kill two million people. The grace and dignity of the film’s subjects will make an even greater impression when held up against the depravity of the perpetrators. The inspiration and uplift of culture is one of the great counterweights we have against the dark impulses that lead to the violence, greed and exploitation that seems to have half the globe in a stranglehold at any one time. Like in this film, we always seem outnumbered but never give up. My new book, Rock Docs: A Fifty-Year Cinematic Journey will be released in late 2015. Copyright 2015, Rick Ouellette. All rights reserved.